On July 11th, Innovative Development co-sponsored ACEDS Philadelphia Chapter’s 2nd Meeting. The evening networking event was held at Marathon Grill on Market Street in downtown Philadelphia. Multiple IDLLC eDiscovery Project Managers attended the event to discuss eDiscovery trends, best practices and meet other eDiscovery Specialists. 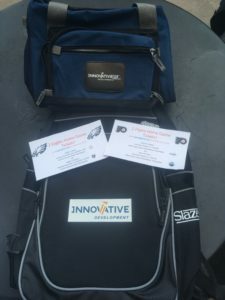 At the conclusion of the event, Innovative Development raffled off several prizes, including: Philadelphia Eagles tickets, Philadelphia Flyers tickets, Innovative Development backpack, and an Innovative Development cooler.